This project is a work in progress. Page 1 describes the charger I originally build in 2006, and page 2 is the updated version in 2010. The charger was designed to regulate the output from my big F&P windmill. And I wanted to make something useful with a PICAXE chip. On this page you will find the circuit diagramme and programme listing, but I offer no support for this project, it is aimed at those who have some experience with PICAXE chips, programming and electronics. Unless you have some experience in these, I wouldn't recommend you try this project. You will also need to design your own circuit board, I used veroboard and its a bit messy. 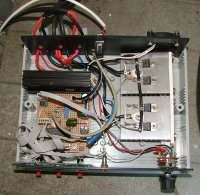 The charger will work on 12 or 24 volt systems, and uses power MOSFETS to do the heavy current switching. 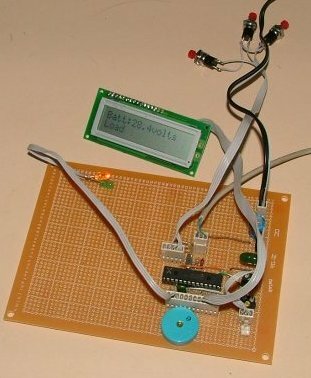 An LCD screen displays the battery voltage, current and menu options. The menu lets you set the charge voltage, load voltage and low battery alarm. 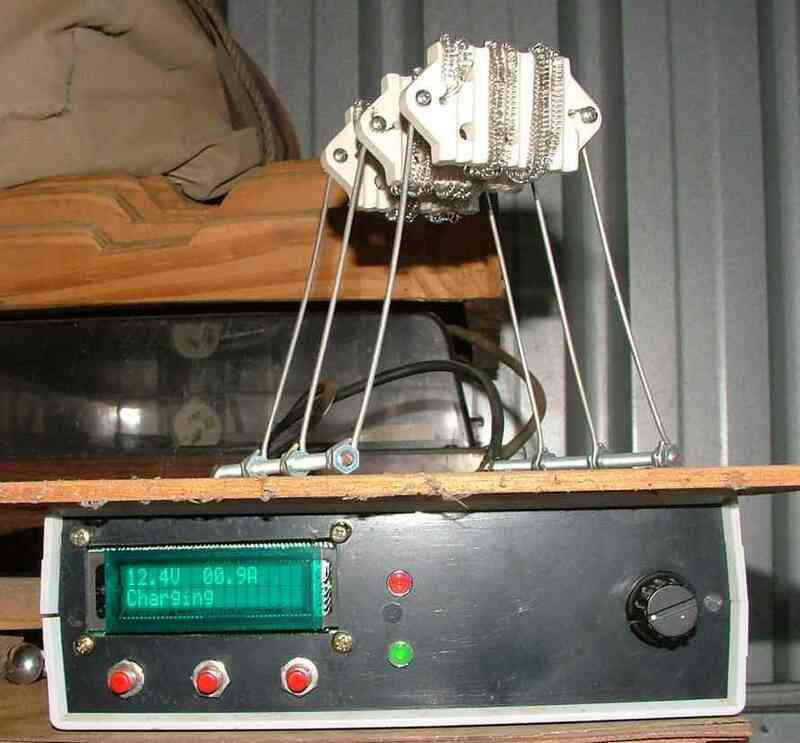 When the battery voltage exceeds the preset load voltage, the windmill output is switched to a load. When the battery voltage drops below the preset charge voltage, the windmill is switched back across the battery. If the battery voltage drops below the battery alarm voltage, the charger will beep continously. If you loose power the PICAXE will remember the values you set. To set the charge and load voltage, press the menu button. The screen will ask you to set the charge voltage using the up and down buttons. As you press the buttons the voltage will change in 0.1 volt steps. Pressing the menu button again and the screen will ask you to set the load voltage. Press again to set the Low Battery alarm value. Press the menu button again will return to normal operation. The power switch is a 4 position dual gang type. Position 1 is off, position 2 is normal operation, position 3 is forced charge ( Boost ), and position 4 is forced load. 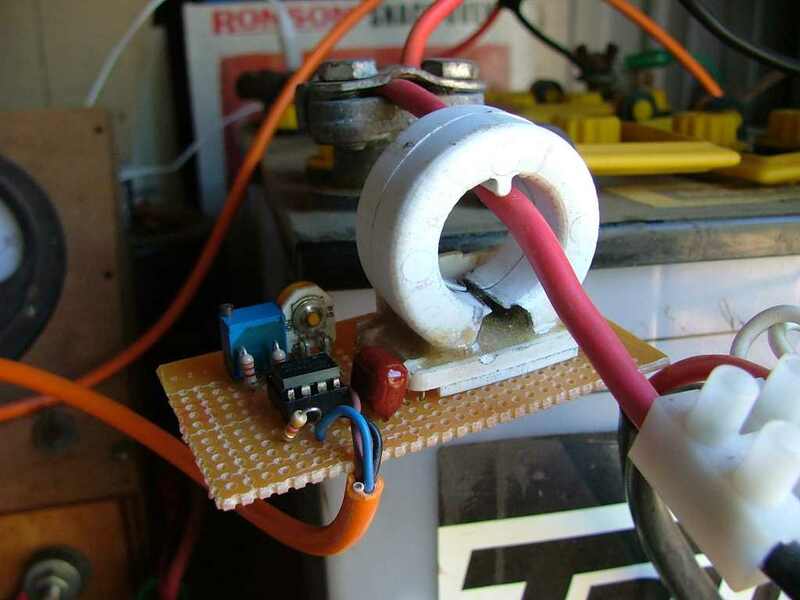 In forced charge, the windmill power is fed straight to the battery with no regulation. Forced load dumps the windmill across the dummy load, handy to shut down the windmill. The controller sends out data via the serial port. This include the battery voltage and current. I did have a little monitor program you could download to display this on your computer, but software changes in the PICAXE mean I will need to rewrite the monitor program. Stay tuned for future updates. The circuit ( Click to enlarge ) was made using parts from my junk pile, so you may have a better understanding of electronics than I do and want to change values to suit. Please do. Click here for a PDF version that may print better on A4 size paper. The PICAXE used is a 28X, needed due to the larger program and extra outputs. 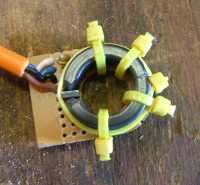 The current sensor is made by cutting (breaking) a iron-powdered toroid core in half, slipping in a hall effect device and gluing back together. This photo is a earlier attempt. You can see how the hall sensor sits in the magnetic path. I reshaped the ends of the core to concentrate the magnet flux through the hall sensor. The easiest way to split the core is to file a grove around the place you want to spilt it, and then lever the two halves apart. They shatter easily, dont drop it. The hall sensor used is a UGN3503U. 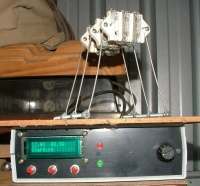 It has a analogue output, proportional to the magnet flux. Dont use the hall sensors from the F&P motor, these have a logic out and are latching. The hall sensor has a output voltage of about 2.5 volts, plus or minus 0.1 volts, depending on the current through the core. This is amplified by the 741 to a range of 2 to 3 volts. The picaxe converts this to a number range of 0 to 255, with 128 being the zero point ( no current ). This gives us a range of -128 to +128. In the software in the DisplayAmp routine you will see 128 used in some maths and if-then statements. By changing the value 128 up or down, you are adjusting the zero point. This is my finished charger. Not pretty, but working. I plan to make up a facia cover to stick on the front face. Should make it look a little more professional. I recently replaced the LCD display with a fluorescent display ( VFD module ). The new display is almost pin for pin compatible with the LCD display, and looks better. Made by Noritake, model CU16025ECPB-W6J, www.noritake-itron.com. A big thankgs to Geoff for the module. You can see my dummy load in this picture, 3 modified jug elements, and they get HOT! Click here to download the PICAXE code. The charger is a work in progress, but it does work, and has been regulating my battery bank ( 2 car batteries connected in parallel ) for over a year now. The 1k drive resistors to the gates of the mosfets should be a lot lower in value to ensure clean switching, like 47 ohms or less. 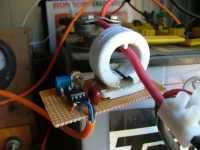 For a higher power charger, say over 20 amps, I would look at using relays instead of mosfets. My mosfets get hot with 20 amps. The current measuring circuit ( op amp, hall sensor ) is not very accurate, give or take a amp at 10 amps. I've since started using current transducers, available for $20 to $40 from www.rsaustralia.com, these are a lot more accurate. 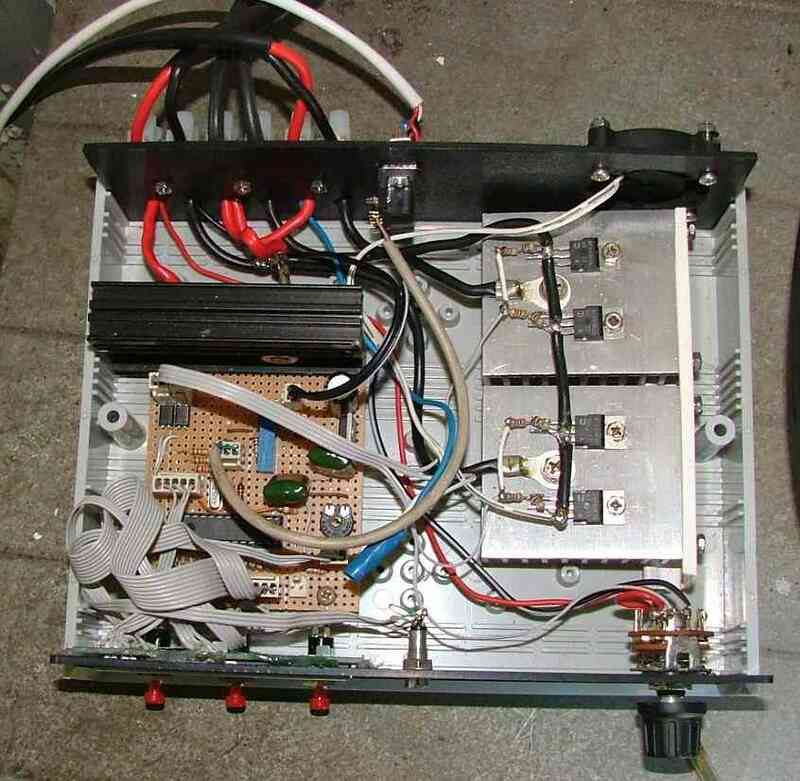 The controller will work just as well as a solar regulator, only we dont need the dump load, so just leave out the dump load circuit ( including the MOSFETS ) if you only want to use the controller on a solar panel. Thanks to the guys that pointed out these problems and made suggestions.